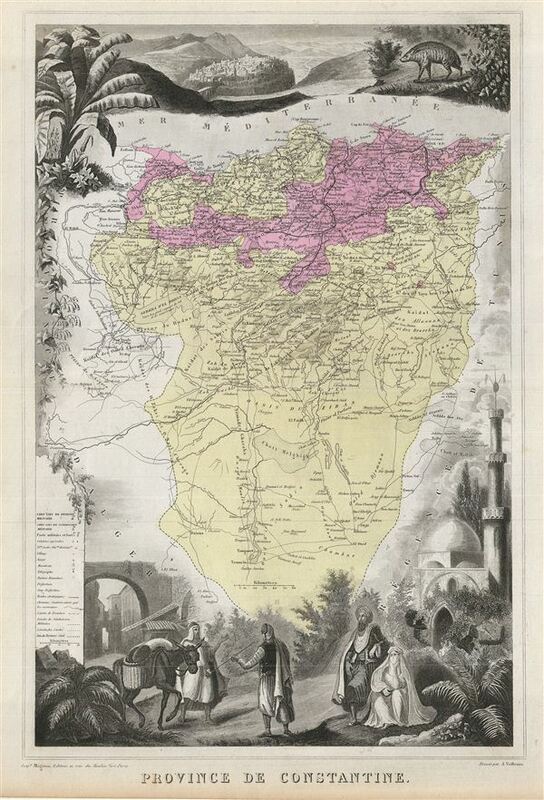 This is a fine example of J. Migeon's 1878 map of the Algerian Province of Constantine. The Department of Constantine existed from 1848 to 1962 and was one of the three administrative districts of French Algeria. The lower left quadrant contains a legend while the top and bottom of the map includes decorative engravings illustrating the Algerian landscape, the town of Oran, and the activities of the locals. After being captured by the French in 1830, Algeria became an attractive destination for european immigrants. However the majority indigenous Muslim population was dissatisfied with the French dominated political system. This dissatisfaction would ultimately trigger the Algerian War and lead to Algeria's independence. Migeon identifies various rivers, mountain passes, lakes and other topographical features are marked. Migeon's Geographie Universelle, published in Paris, is one of the last great decorative atlases of the 19th century. It contains many stylistic elements of early 19th century cartography such as full hand coloring, numerous decorative vignettes, and high quality paper. This map was issued in Migeon's Geographie Universelle.